Welcome to the page designed to tell you all you need to know about how to join ERFC for Season 2019. Click on the age group relevant to you and read through the information carefully to understand the full process. Note that there have been significant changes to the trial process ahead of the coming season. There are no trials for our Spiderlings Program for three and four year olds. Instead places are available on a first come, first served basis. Registrations for places in this age group are now open! Places are capped due to pitch availability. The only way to register for the program is via Football Australia's new online registration portal Play Football (replacing the MyFootballClub website from Season 2019). For information, including an IMPORTANT registration guide, please see the ‘Our Programs’ tab on the website and click on the ‘Saturday Program: Spiderlings (Under 3 to Under 4)’ section. The registration fees for our programs can be seen below. There are no trials for our Saturday Small Sided Football Program for 5, 6 and 7 year olds. Instead places are available on a first come, first served basis. Registrations for places in this age group are open and are expected to fill by the end of February. Places are capped due to pitch availability. For information, including a registration guide, please see the ‘Our Programs’ tab on the website and click on the ‘Saturday Program: Small Sided Football (Under 5 to Under 7)’ section. Trials for all teams from U8s up are a necessary part of our preseason, helping us sort over 600 players into teams for the new season and ensuring every player is playing with a squad that is most appropriate for their level of experience and ability. We are pleased to be able to announce the dates for upcoming trials as per the table below. Players are to attend the session for the age group determined by their birth year. The table below can help you understand this better. Any exceptions to this arrangement is to be discussed in advance with the applicable Head Coach. We do understand that trials can be a daunting experience for some players and as a result we have made changes to the format for this year as we constantly try to refine and improve the process. Several of our experienced female team coaches have a belief that our young female footballers will benefit from a different trial format. In line with ERFC’s commitment to developing and improving our young footballers, we believe that proper core skill analysis and assessment will be a huge platform for the girl’s program to build on. The first session will be a series of station work, with each station focusing on a core aspect of football. With this, both player and coach will have results that both parties can then aim to improve. Following on from this session, there will be two sessions of practice games, where coaches can then assess the players technical ability in game related scenarios. After the conclusion of trials, the Football Department will communicate PROVISIONAL team selections for the coming season. In a further change to recent years, there will then be a two-week window provided requiring a $100 non-refundable deposit to secure team selection. At the end of the two-week deposit window, age groups where we have not reached maximum squad sizes will remain open for new enquiries with the club actively seeking to fill the remaining spots. 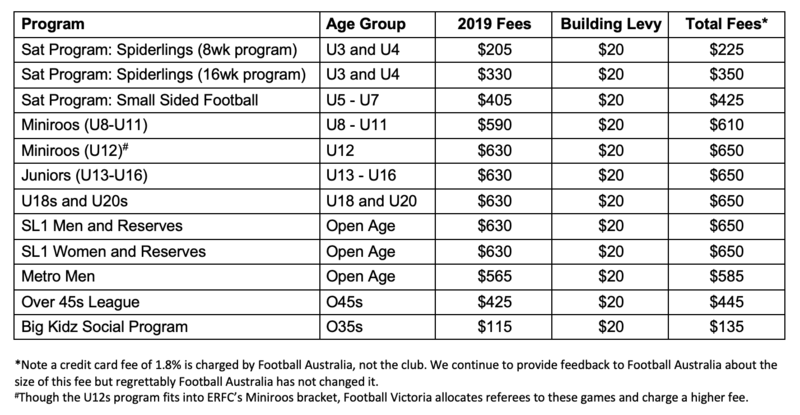 Full registration and payment of remaining fees for all ERFC players will then occur from late-January via Football Australia's new online registration portal Play Football (replacing the MyFootballClub website from Season 2019). Registration and payment of remaining fees is a mandatory requirement for all players wishing to begin preseason with our club with those failing to pay remaining fees forfeiting their place in line with our strict No Pay, No Play policy. This ensures teams can be finalised, all players are protected by insurance and uniforms can be ordered at the earliest opportunity. Note that due to the administrative burden that payment plans cause our volunteer committee members, payment of all fees will continue to be via debit/credit card and the Play Football portal only. Please plan now to avoid disappointment. Players of like experience and ability will be grouped together and will participate in a series of small sided games to better replicate a meaningful game environment. In line with the club’s football philosophy of ‘proactive, possession based football’, players will be evaluated based on their technical ability, NOT their game impact. As players are evaluated by the Head Coaches and respective team coaches, groups will be reset each week enabling us to move closer to provisional team selection after each trial. Trials for our U18 and U20 Boys teams up are a necessary part of our preseason and occur alongside our State League 1 Reserves, helping us sort over over 100 players into teams for the new season and ensuring every player is playing with a squad that is most appropriate for their level of experience and ability. By trialling our U18s, U20s and Reserves together, we aim to accelerate the development of our most talented juniors by selecting them to play and train with our State League 1 Reserves, with the bulk of the players then being chosen to play in one of our two U18 Boys or our U20 Boys teams. Trials for our U18, U20 and State League 1 Reserves teams will occur in early January. A date will be announced on this page, on Facebook (click here) and via email. Throughout the trial process, coaches will provide you feedback on your progress with the aim of finalising squads by early February. You will then be invited to register and pay all fees via Football Australia's new online registration portal Play Football (replacing the MyFootballClub website from Season 2019). Registration and payment of remaining fees is a mandatory requirement for all players wishing to continue preseason with our club with those failing to pay remaining fees forfeiting their place in line with our strict No Pay, No Play policy. This ensures teams can be finalised, all players are protected by insurance and uniforms can be ordered at the earliest opportunity. Trials for our U18s Girls teams up are a necessary part of our preseason and occur alongside our State League 1 Women and Reserves, helping us sort players with a wide range of ability into teams for the new season and ensuring every player is playing with a squad that is most appropriate for their level. By trialling the three teams together, we aim to accelerate the development of our most talented U18s by selecting them to play and train in a more competitive competition, while supporting our younger and less experienced players with targeted coaching from our U18s Girls coach. Trials for our U18s and our State League 1 Women and Reserves teams will occur in early January. A date will be announced on this page, on Facebook (click here) and via email. Trials for our State League 1 Women and Reserves begin from early January and are by invitation only. If you are a new player and wish to submit an Expression of Interest in trialling with either team, complete this form. Throughout the trial process, coaches will provide you feedback on your progress with the aim of finalising squads by early February. You will then be invited to register and pay any required fees via Football Australia's new online registration portal Interact Sport (replacing the MyFootballClub website from Season 2019). Registration and payment of remaining fees is a mandatory requirement for all players wishing to begin preseason with our club with those failing to pay fees in a timely manner will forfeit their place in line with our strict No Pay, No Play policy. This ensures teams can be finalised, all players are protected by insurance and uniforms can be ordered at the earliest opportunity. Note that due to the administrative burden that payment plans cause our volunteer committee members, payment of all fees will continue to be via debit/credit card and the Interact Sport portal only. Please plan now to avoid disappointment. Trials for our State League 1 Men and Reserves begin from early January and due to the highly competitive and skilled nature of the league, are by invitation only. If you are a new player and wish to submit an Expression of Interest in trialling with either team, complete this form. Existing ERFC players need not submit an EOI - details about trials will be emailed to you once they are finalised. Preseason training for our social Metropolitan League Men's teams (Metro League 3 and 5) begins in early February and doubles as informal trials. Details for these programs are being finalised at the moment and will be shared via Facebook, email and on this website son. 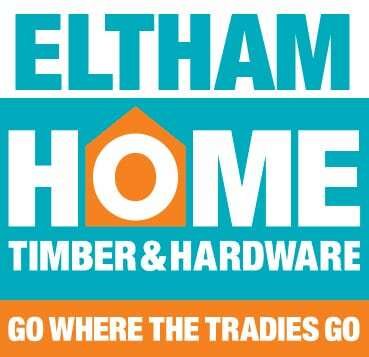 To be referred to the coordinator for this program, email secretary@elthamredbacksfc.wpmudev.host. Registration and payment of fees is a mandatory requirement for all players wishing to begin preseason with our club with those failing to pay fees in a timely manner will forfeit their place in line with our strict No Pay, No Play policy. This ensures teams can be finalised, all players are protected by insurance and uniforms can be ordered at the earliest opportunity. Fees for Season 2019 are shown below. As always, we make every effort to mimimise the cost of playing football while continuing to offer a program that befits the Redbacks name. Our registration fees are all inclusive and go towards club uniform (shorts, socks, jacket), referees fees, FFV team entry fee, player insurance, FFV player registration fee, local council fees and charges, equipment and other miscellaneous costs (line-marking, facility maintenance, etc…). We do not require any other payments to play with us through the regular season. 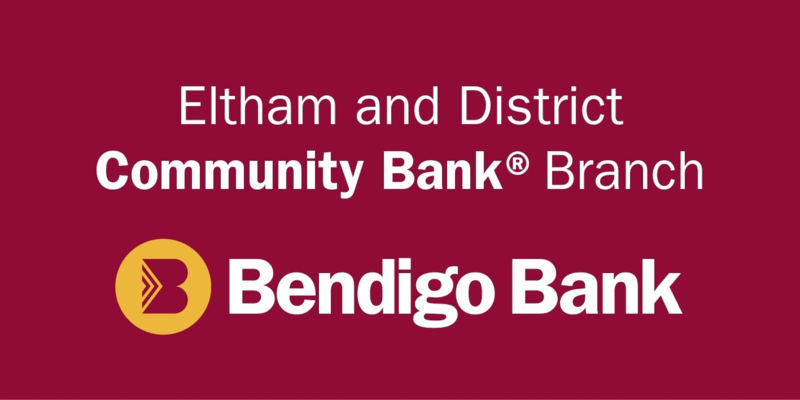 A $20 building fund continues to be added to fees to contribute towards the cost of our new clubrooms.